Most Monday morning newspapers in the UK were splashed with Emmanuel Macron’s victory in the French presidential election, with pundits fretting over what the Europhile centrist’s victory will mean for Brexit Britain. While the failure of far-right candidate Marine Le Pen was cause for relief among much of the liberal media, conservative tabloids like the Daily Mail were blatantly dejected by Macron’s landslide win. The Independent’s reporter Jon Stone remarked on social media that while the Mail was happy to splash on Le Pen’s leap to the second election round, Monday’s front page neglected the French presidential run-off altogether. Other papers focused on the potential disadvantages Macron’s presidency could bring the UK as it negotiates its way out of the European Union. “Sacre bleu! Why new French President Macron is bad news for Brexit Britain,” wrote the Rupert Murdoch-owned Sun. “Macron has also made noises about exploiting Brexit to France’s advantage, wooing banks, researchers and academics across the Channel. Crucially, he made this pledge standing on the steps of Downing Street after enjoying Theresa May’s hospitality. That’s gratitude for you,” echoed Times columnist Matt Chorley. “France’s new hope puts cloud over Brexit,” splashed the Tory-leaning Telegraph. The liberal press was less doom and gloom, hailing the new president as a “beacon” to the left and the anti-fascist movements in Europe. “In the UK, [Macron’s] rise has been followed with keen interest by politicians keen to lay claim to what they regard as British politics’ deserted centre ground,”argued writer Gabriel Bristow on Monday’s Independent. “For those Labour MPs desperate to return to this ‘extreme centre,’ Macron is a beacon. Their worldview profoundly shaken by Brexit and Trump, they once again find themselves in blissfully familiar territory,” he added. “France stems tide of the populist revolution,” read the paper’s Monday front page. The liberal commentator went as far as suggesting Macron is truly the leader of the future. 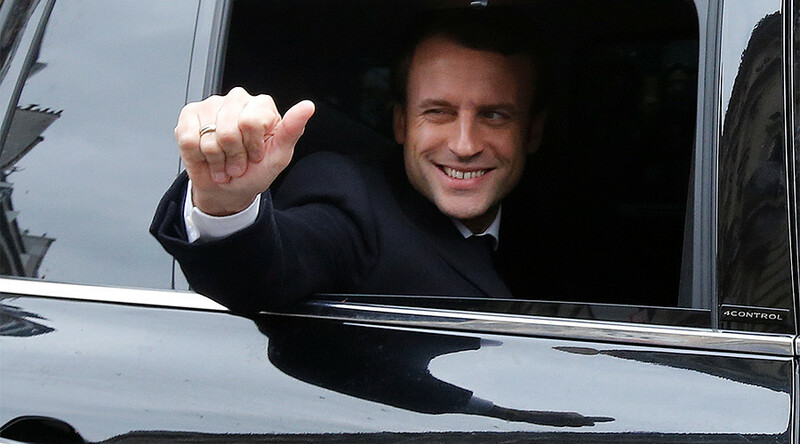 “Macron has, in ending the left-right split, and slowed down the growth of populism, but – equally important – he has created a central platform that is strong, ambitious, reforming and optimistic, built on a clear understanding of the new world,” he wrote. However, many were happy to simply make a series of unfortunate puns, like the British freebie Metro, which ran with the headline “Le Big Mac”.